Having clearly been asleep under a stone for the last half century and a bit I was none the wiser about who Annie Dillard was until a beautiful little hardback copy of The Maytrees arrived from Hesperus last year. Pulitzer Prize-winning author it declared, loud and clear, in that case better read thinks I.
I have started and stopped The Maytrees three times now and, despite the accolades, I have just not been able to get into this book properly. I'm convinced that this is a great, bordering on brilliant book from what I've read elsewhere and I've picked it up at the wrong moment or not read enough in one sitting to get a feel for the whole. I've done this countless times with Gilead by Marilynne Robinson and I haven't given up on that yet either. Beyond this there is stellar praise for Annie Dillard whichever way I turn on Google. 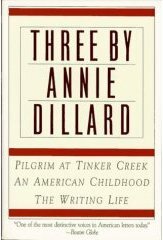 Years ago I might just have dismissed as 'not my bag' and moved on to the next book, but I rarely do that these days especially when I source the pedigree and the path that a writer has taken and Annie Dillard's life seems particularly fascinating and her writing extensive. This is a book I absolutely don't want to be defeated by and I have come to the conclusion that I need to go back to the beginning with Annie Dillard. I want to try and properly grasp and fall into step with her prose style, so I bought a triple decker Dillard, Pilgrim at Tinker Creek, An American Childhood and The Writing Life and so today, fellow salon visitors, I have been mostly Dillarding. I knew I was right not to surrender and now I'm very hopeful of progress even if it is at snail's pace. Does this happen to anyone else ? Is there an author you are really glad you persevered with?